Powered by Annapurna Labs Quad Core TeraStation 5210 is equipped with the powerful Annapurna Labs Alpine AL314 Quad-Core Processor and will impress users with both faster transfer of large files and faster file access from multiple computers. Its top-of-class performance is perfect for demanding small, medium, and growing businesses. 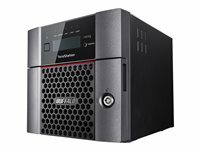 Hot Swap function for added data security With Hot Swap functionality, even if a drive fails, the TeraStation 5210 will automatically power down the faulty drive to allow its safe removal and replacement without interrupting work or causing any data loss. Business class features The Buffalo TeraStation 5210 offers business class features such as, Hot Swap drives, disk quota, share level replication, failover, support for ISCSI target and 4B of fast DDR3 ECC memory is installed.